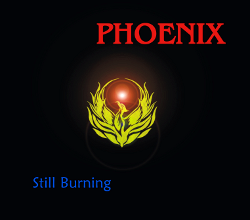 Phoenix Still Burning available for download in STUDIO QUALITY!!!! Originally formed in 1976 from the ashes of 70’s super group ARGENT, the band recorded 3 albums before splitting amicably to allow John Verity to concentrate on record production. While both Bob Henrit and Jim Rodford toured the world with the KINKS Since then however, the guys have taken every opportunity available to come together for impromptu gigs, and session work wherever possible - Bob has been the regular drummer in the John Verity Band for live work and recording, with Jim often filling bass duties. Following some festival dates in the summer of 2009, the guys went into the studio to record with Mark Griffiths on bass and Ian Gibbons on keyboards. Oh YES, The PHOENIX is back! Read more about the NEW ALBUM including full track listing and pictures. "Still Burning" is now available on CD and downloadable as MP3 worldwide from CDBABY and will shortly be available on iTunes. It was during ARGENT's final tour of America that Lead Vocalist/ Guitarist JOHN VERITY, Drummer BOB HENRIT, and Bassist JIM RODFORD came up with the idea of forming a new band with a more straight-ahead, rocky sound combined with strong vocals and compelling hook-lines drawn from a wealth of experience and years on the road. The Argent split was amicable and since John, Bob and Jim were great friends who also admired each others musical abilities, a new band seemed an obvious progression. Rehearsals began on their return to the UK at John's house in North London where demos were also recorded. All three friends had material ready to be worked on and soon there was enough to record a whole album. A management deal was secured with Trident in London, who also had a studio in London's West End where many major artists recorded - including The Beatles with 'Hey Jude'. Our intrepid 'Power Trio' was very soon burning the midnight oil, recording tracks for their first album; now under the watchful eye of CBS Records. The new band was to be called 'H.R.V' - Henrit, Rodford, Verity. The album title was to be along the lines of: 'HRV like a Phoenix rising from the ashes of Argent' but the record company and the media soon latched onto the name Phoenix so a quick re-appraisal quickly established the name as 'PHOENIX'. The album was released in 1976 and the band was soon on the road as planned. Firstly for a serious of warm-up dates in the UK followed by a tour of Europe as special guests to headliners 'Aerosmith'. A second album recorded for CBS but finished under the guidance of Rocket Records remains unreleased although a couple of singles - including a version of 'Time of the Season' - came out on Rocket. JV continued with the record production and solo recording whilst Bob toured the world yet again with the Kinks. Never far apart, the pair were soon working together playing powerful blues/rock as the John Verity Band - until the demand and desire for a new Phoenix became just too strong. Plus familiar songs drawn from tracks the guys have played on and been associated with throughout their long and varied careers... Check the Gig List for confirmed dates and the Shop for available recordings and videos. Keep up to date with the latest Phoenix news, gigs and freebies by subscribing to our mailing list we never misuse your information and you may unsubscribe at any time. The Amp Doctor, These guys have been looking after our gear for years - Mick is a fantastic valve amp boffin who can sort anything out!